Spacious and comfortable chalet in the heart of the village Chapelle d’Abondance with sauna, fireplace and free WiFi. Situated only ~300 m from the chairlift Crêt Béni in Chapelle d’Abondance. The funicular Panthiaz, ~1 km, provides access to the French-Swiss ski area Portes du Soleil; free ski bus ~30 m from the chalet. There are nine bedrooms, five bathrooms and three separate toilets on three floors. New and well-equipped kitchen, spacious dining area with a big table for 20 people, as well as a cozy living area with fireplace and TV / DVD-player on the ground-floor. All three rooms have access to the south facing balcony, where you can enjoy views of the mountains. Private garden and south facing terrace. Spa area and outdoor jacuzzi. Private parking for approx. six cars directly in front of the chalet. Located in the village centre, where you find typical Savoyan restaurants and a bakery. Various shops, boutiques, bars, cafés, a bowling alley, an ice rink, new waterpark (with wellness area and sauna), and childcare facilities (from two years) in Châtel, ~5 km. Please note: The maximum number of persons allowed is 20, although the sleeping capacity is higher. 650 km Ski slopes, 211 chair lifts and cable cars. 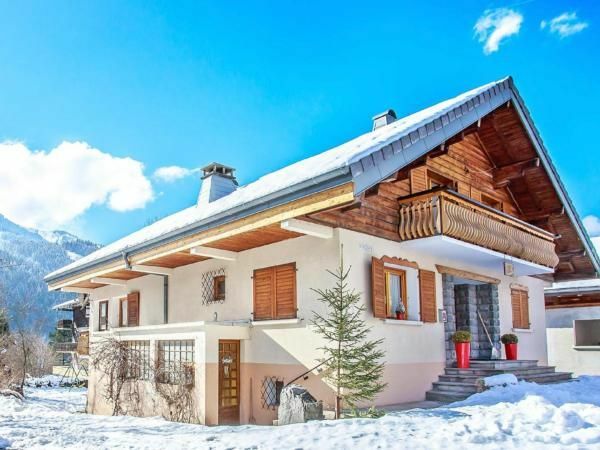 Altitude of chalet ~1,000 m. The Swiss-French ski area Les Portes du Soleil (Portal of the Sun) is a great and extensive ski area between Lake Geneva and Mont Blanc, with impeccable ski slopes. New in Châtel: ski link between Linga and Super-Châtel via two chairlifts and slopes. There are magnificent slopes in the deep powder snow (a guide is recommended; use at own risk) as well as wide ski slopes suitable for families. Snowboarder appreciate the Smooth Park, Boardercross or the FFS-Halfpipe. In Châtel are some marked snowshoe hike trails and the ice skating rink Lac de Vonnes. - Final cleaning: once per object Costs amounting to 250 EUR (optional). - high chair: per object and day included in price . - Bed linen: per person and week for rent at a price of 15 EUR (optional). Bed linen (per person and week, according to consumption 15 EUR). Cot (per property and day, included in price 0 EUR). Final cleaning (once per object, Costs amounting to 250 EUR). Parking facilities (per property and day, included in price 0 EUR).